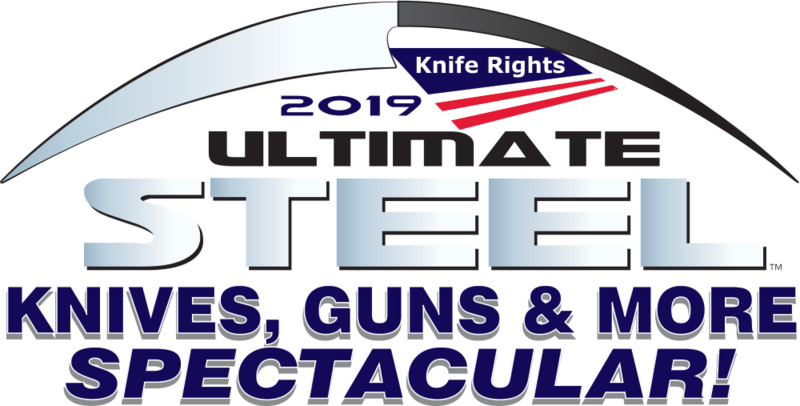 Knives being arms protected by the Second Amendment is half of Knife Rights’ foundational principles expressed in our logo: Essential Tools – Essential Rights™. While knives are tools used by millions of Americans at home, work and while recreating, sometimes they are also tools used as arms in order to protect one’s person or family. In some areas of the country, they are the most effective legal self-defense alternative to banned firearms. Clinton has made no secret of her anti-gun and anti-Second Amendment agenda; it’s a major plank of her campaign. She is aiming to eviscerate the Second Amendment. There is no question about her intention to attack it via legislative support for anti-Second Amendment bills, executive actions, and more critically, through her appointment of justices to the Supreme Court. Over many years Clinton has endorsed virtually every proposal, no matter how outrageous, to limit gun ownership and destroy the Second Amendment through taxes, regulations, and executive orders. 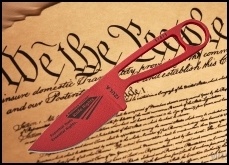 The loss of Second Amendment rights by way of her anti-gun agenda would be certain to disadvantage knife owners as we fight to oppose irrational restrictions on our knives. As we have seen elsewhere in the world, once firearms are outlawed, knife restrictions follow. Few issues in this year’s campaign offers a bigger contrast than this one. Trump has been equally adamant in his pro-Second Amendment stance. It has earned him the endorsement of the NRA and other Second Amendment organizations. His proposed nominees for the Supreme Court have a record of opposing efforts to weaken the Second Amendment. 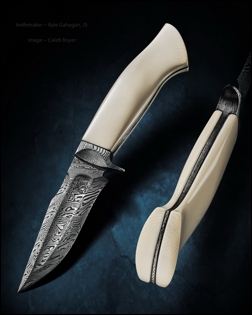 As I have previously pointed out in these emails, and as has been well-documented, the recent irrational attacks on ivory owners in the U.S., including owners of ivory handled knives and raw ivory used by knifemakers and scrimshaw artisans, was launched by the Clinton Foundation as part of their Clinton Global Initiative. With the Federal ban now in effect and numerous state bans passed that also include fossil ivory from species extinct for 10,000 years, they are not nearly finished. The Clinton Foundation and Non-Governmental Organizations affiliated with it continue to advocate for the complete and total ban on all trade in ivory in any form. They continue to work towards that end both here at home and internationally. As we saw recently in New Jersey, efforts are afoot to even regulate and prosecute mere ownership of ivory. They are being assisted in this by the Interior Department’s Fish and Wildlife Service that has become little more than an extension of Humane Society of the United States and the rest of the radical animal rights movement. They are even pushing to ban sustainable use of wildlife in Africa, the core science behind the world’s most successful wildlife conservation efforts that have brought many species back from the brink of extinction. It matters not that these bans on legal ivory that’s been in this country for decades can’t stop illegal poaching, nor that these bans have resulted in an arguably unconstitutional taking of hundreds of millions of dollars from law-abiding Americans to no good end. There is nothing to suggest that a Clinton presidency will not continue to push for a total ban on all ivory trade and a non-science-based ban on sustainable use to the detriment of many knife owners, knifemakers and artisans, as well as wildlife. The foundation’s ivory ban advocacy strongly suggests that Clinton will also likely oppose passage of the African Elephant Conservation and Legal Ivory Possession Act in Congress. This act would repeal the recent Federal ivory ban, resetting the rules back to where they have been for decades and would positively enhance elephant conservation efforts in Africa. In the unlikely event it was passed during her presidency, she would likely veto the bill. On the other hand, Trump has never advocated for ivory bans or the end of sustainable use as a science-based conservation model. His sons Donald, Jr. and Eric Trump are both strong advocates for sustainable use both here and abroad. While Trump is not a hunter, he has publicly supported his sons’ participation in the hunting and shooting sports. A Trump presidency is far more likely to result in executive appointments that would effect a significant change in attitude at the Interior Department and at Fish and Wildlife Service. If the African Elephant Conservation and Legal Ivory Possession Act was passed by Congress, he would likely sign it. Again, regardless of who wins the election, Knife Rights will continue to fight for a Sharper Future™ for all Americans. That what we do. And, as previously noted, for many neither Clinton or Trump would be your first choice to lead American forward. Regardless, one of these two candidates is going to be the next president. Whoever is your choice, however reluctant that choice may be, be sure to vote. Your future, and because the next president will appoint two or three Supreme Court Justices, that of future generations is at stake. And, for what it’s worth, in my opinion this isn’t the election to vote for third-party candidates, for whatever your reason. It certainly isn’t an effective protest vote, it’s simply a vote for whichever one is your least favorite, Clinton or Trump. Every vote should count and the only way to make your vote count for real in this presidential election is to vote for one of the major party candidates. Your vote is your voice and it’s your future at stake. Go VOTE! DO NOT Try to Take Your Knife into a Presidential or VP Candidate’s Rally! Thousands Confiscated! 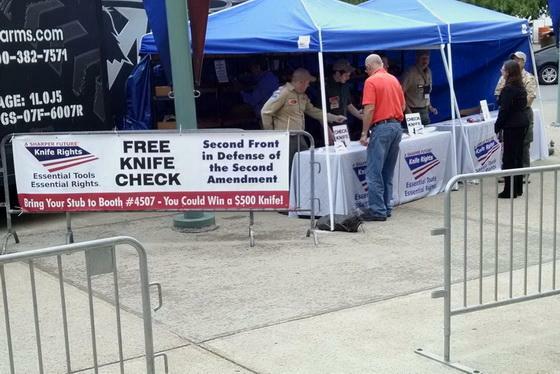 While Knife Rights’ Knife Check worked great at Donald Trump’s NRA Annual Meeting appearance, we can’t follow all the candidates around the nation doing knife checks. If your try to enter a presidential or vice-presidential rally with a knife (or almost anything metal except for car keys), it will be confiscated or you will be turned away! At many of these rallies, hundreds of attendees are losing their knives. Nationwide, thousands of knives have been confiscated! In most instances, once confiscated you’ll not be given the opportunity to reclaim your knife. Leave your knife at home or in your car. We were reminded of this by an article about 200 knives confiscated at a rally in Prescott Valley, Arizona. In this case, kudos go to the Prescott Valley Police Department who are allowing folks to claim their knives. Again, in most cases, once confiscated they are gone for good!